We’re living in a time where we always want more. More data! Faster networks! We can’t just watch one episode. We have to binge an entire season. Gone are the days of flipping through a book when Google is at our fingertips. When these services slow down, all hell breaks loose. Let’s face it, three-year-olds aren’t going to wait patiently when they want to watch Beauty and the Beast on Netflix … for the sixth time in a row. With the push for more everything, comes the need for additional fiber-optic networks to be built. This is leading to contractors looking for a cheaper and less disruptive way to install these projects. Enter microtrenching. Microtrenching is achieved by pairing a microtrencher attachment with a host machine (what that machine is depends on the manufacturer). Vermeer, Ditch Witch and Coneqtec-Universal all have models ideal for the work (we’ll touch on individual product lines in a bit). So, just how micro is a microtrench? Well, the depth of a microtrencher also varies among those manufacturers. For example, Vermeer’s MTR12 will trench up to 12 in. deep, while its MTR16 goes to 16 in. Coneqtec-Universal offers models that trench as shallow as 6 in. to as deep as a foot. The Ditch Witch organization offers three microtrencher attachments: the MT9, MT12 and MT16. Each microtrencher has an infinitely variable, hydraulic plunge feature that provides operators variable depth control. The MT9 can create a clean, narrow trench up to 9 in. deep, the MT12 up to 12 in. deep and the MT16 up to 16 in. deep. The width of a trench seems standard from the three companies we surveyed, ranging from 0.375 in. to 2.5 in. As for how quick microtrenchers can install fiber, it all depends on the project and what you’re working with (the machine) and what you’re working in (the ground conditions). According to Ed Savage, Vermeer product manager, production rates vary depending on jobsite conditions and obstructions. Some contractors will be able to install up to 3,000 ft of conduit in a day. 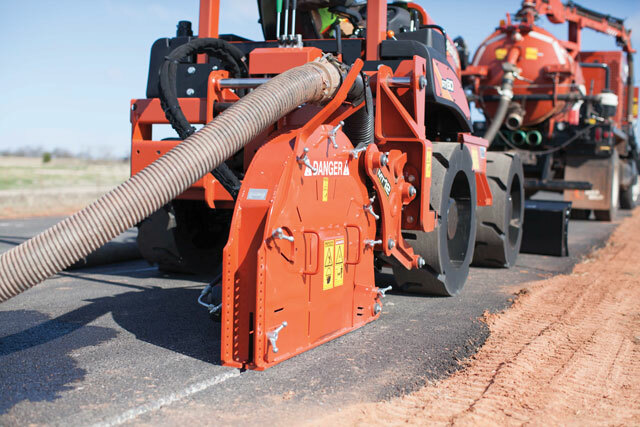 In recent years, companies such as Vermeer, Coneqtec-Universal and Ditch Witch have all added products to the microtrenching market. 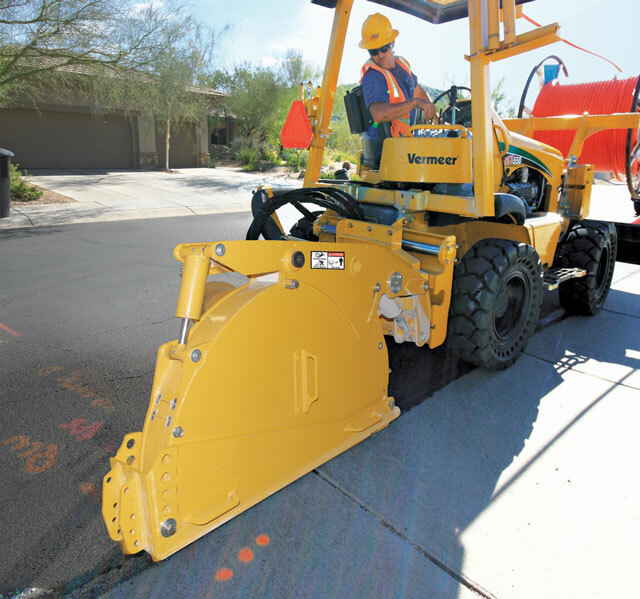 Vermeer’s lineup includes two microtrenching attachments designed to work with the company’s RTX550 tractor. As previously mentioned, the MTR12 and MTR16 both trench up to 12 and 16 in., respectively. Coneqtec’s microtrenching attachments are made to couple to a skid steer or compact track loader, giving any owner the versatility to branch into this type of work with less investment. Ditch Witch has developed a variety of microtrenching attachments in response to customer needs. Its lineup of microtrenchers includes the three standard units and a number of special order units. The Perry, Okla.-based manufacturer offers its MT12 and MT16 microtrenchers that work together with its RT45, RT55 and RT80 trenchers. The latest Ditch Witch microtrencher is the compact MT9 that works in tandem with its line of mini skid steers. 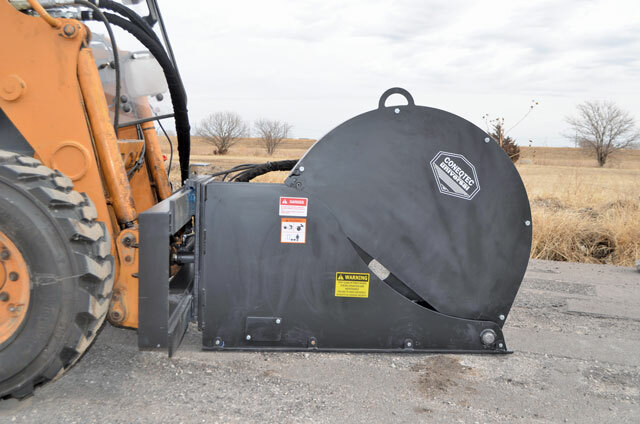 It’s been nicknamed the “crosscut saw” as its unique push-pull design and compact size make it perfect for completing installations across streets in congested areas. According to the company, this industry-first system is the ideal solution for tight and confined residential areas, such as street crossings. The MT9 creates clean, shallow trenches up to 9 in. deep and 0.375 to 1.5 in. wide. Aside from the actual microtrencher unit itself, manufacturers point out some supporting equipment for the job. Perhaps the most recommended is a vacuum excavator to collect spoils. The vac connects to the attachment’s cutter wheel to clean up as the work progresses. Savage also says an asphalt sealer may be used to finish the cut flush with the surface. Last year, the Ditch Witch organization released its 1CM concrete mixer attachment to assist in the reinstatement of the trench after work is complete. The unit includes a 100-gal mixing tank, adjustable hopper chute and electric vibratory motor designed to efficiently fill the trench with precision. Coneqtec-Universal’s microtrencher attachments couple to skid steers and come in 6- and 12-in. depth models. Before getting to work, contractors should review the operator’s manual as well as contact one-call to locate any existing utilities. Savage also recommends surveying the site and the intended path of the trench. Runner also cautions operators about finding the sweet spot when using the hydraulic attachment with a skid steer. Donohue and Pfeiffer Enterprise Inc. demonstrate Vermeer’s microtrenching equipment and Vac-Tron’s LP SGT high-cfm unit in Glen Bernie, Md. As mentioned in the article, microtrencher operators rely on vacuum excavators to keep the jobsite clean as they cut. Florida-based vacuum excavator manufacturer Vac-Tron Equipment has gone one step further in the cleanup process by developing a solution for microtrenching using a specialized in-tank filter inside the vacuum excavation unit’s debris tank. In most cases, the in-tank filter eliminates the need to add water to the microtrenching process and eliminates excessive material from reaching the cyclone separator. By using this filter, the company says it will reduce the cleanup time during the trench run because there’s no need to stop and clean out the cyclone or unclog the exit hose from the debris tank due to caked material — increasing overall efficiency onsite. David Donohue of Vermeer Mid-Atlantic says “The Vac-Tron LP 573 SGT is the ideal vacuum for microtrenching. The high cfms and low noise output made communication and productivity simple.” For more info, visit vactron.com. Read even more about microtrenching here.